As sure as Christmas comes every December, just a few weeks before it comes a Need for Speed game from Electronic Arts. This time it's the heavy-hitters from Criterion - the team that brought the world Burnout - at the wheel. 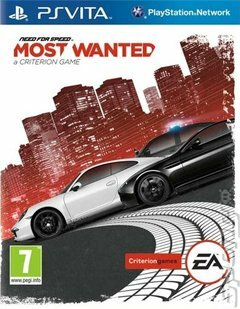 Two years ago criterion delivered their first NfS game with a reboot of Hot Pursuit, this time they are giving a turbo boost to another previous NfS title - Most Wanted. Once again,the action takes place in a large open world environment, along the lines of the one Criterion introduced to the racing in Burnout Paradise. This time, it's called Fairhaven City. Unlike most other driving games, almost every car is available from the get-go. Each car has events tailored to its particular performance and handling strengths. Complete them all in your own time, and your preferred order to rank up. Awesome exotica such as the Lamborghini Aventador LP-700, Marussia B2, and the Koenigsegg Agera are joined by down and dirty drivers cars like the Ariel Atom, BAC Mono and Caterham Superlight R500. Every car can be modified to make it drive and handle the way you need to complete the mission in the game and get the drop on the cops. As the title suggests, you're the cops favourite person, but not in a good way. So as you compete against other drivers in NfS signature long-distance point-to-point races, you'll also have to dodge and weave to avoid the police's attention. In the single-player game, you'll campaign to be most wanted, in races that let you choose your own route to the finish, so it's as much about exploiting the shortcuts as it is about driving the fast and clean. But remember, the better you get the more the cops will be on your tail. Criterion has been instrumental in bringing some of the best online and multiplayer features to the arcade racing genre, and this game is no exception. Along with the usual head to head realtime races, there are a host of other online competitive and even co-operative challenge modes. Most Wanted will continue to feature the innovative Autolog system to enable you to compete with friends even when they are not online through leagues, rankings and goals system. This time round Autolog is more closely integrated into the game world, rather than being separated out in the menu system. As you free-ride around the game-world and pass each jump, speed camera or Jack Spot, you'll get a quick glimpse of the leaderboard. Think you have a chance? Just take a run up and have a go. Get the biggest air on a billboard jump, and it'll be your ugly mug that other gamers will see in their game. Most Wanted features the all-new CloudCompete social gaming system, and this introduces revolutionary cross platform competition and levelling up, so that progress gained using your profile on one platform can be continued on another.